Spotted in the obligatory pun aisle of an unspecified Lidl. Posted in Misc and tagged Kangaroo, legs at 1:46 pm on March 3, 2016 by Broadsheet. It’s very good for you, lower in fat than other meats. And they are a pest over there so, win win? The pest is not the kangaroo. I have visions of Skippy on crutches. Sob! Anyone Cairns do it, Clampers Cairns! 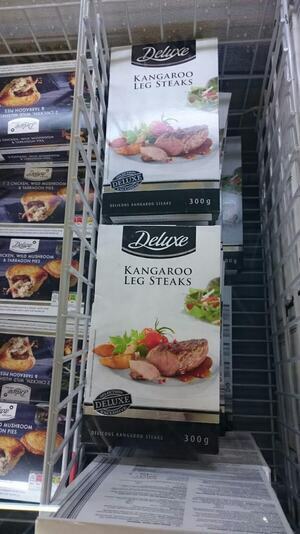 I had these last Christmas, flash fry them for 90 seconds each side in a very hot pan and you’re in for some kangaroo goodness, they’re absolutely delish. Correct, why is this news? They have sliced bread as well, anyone care to upload a picture? Because of the typo I think….’delicous’? There is a great Aussie restaurant in Armagh that serves it up real well and with some fine sauce. Id jump at the chance to try these. Dere aetin deh Kangeroooooes, Joooe! Tastes like chicken……if they had big tails and pouches. Breaking news: ostrich is also pretty good, but can get very dry.